Nighttime time-lapse of Rio de Janeiro from a favela area. Aerial flight over the rooftops tilting upto a Favela. Rio De Janeiro, Brazil. Shot in 4K. 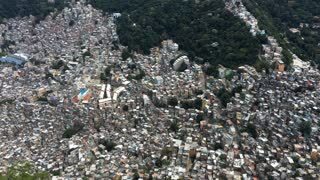 Aerial view over the rooftops tilting upto a Favela. Rio De Janeiro, Brazil. Shot in 4K. Aerial view of soccer a pitch flying over a Favela to reveal the ocean. Rio De Janeiro, Brazil. Shot in 4K. RIO DE JANEIRO - MARCH 21, 2016: Workers from the municipal COMLURB agency work to repair the streets in the Favela Vidigal Community between the flow of daily traffic.